Tianyi Luo is a senior manager with the Aqueduct Project at the Global Water Program at World Resources Institute. WASHINGTON DC, May 11 2018 (IPS) - Most power generation consumes water, whether to cool steam in thermoelectric plants or power turbines for hydropower. And the global demand for both water and electricity will continue to increase substantially in the coming decades. Although growth is generally a good thing for the economy, it challenges nations—particularly ones that are water-stressed—to better manage their limited water resources and invest in the right energy systems. Power generation from solar photovoltaic (PV) and wind is clean and requires zero or little water use. These renewable forms of energy can help countries meet their increased demand for electricity without adding carbon emissions or consuming water. This could be particularly beneficial in countries where growing populations, farms and industries are already competing for scant water supplies. For example, a recent WRI analysis shows that India could reduce its water consumption intensity by more than 25 percent just by achieving its renewable energy targets. 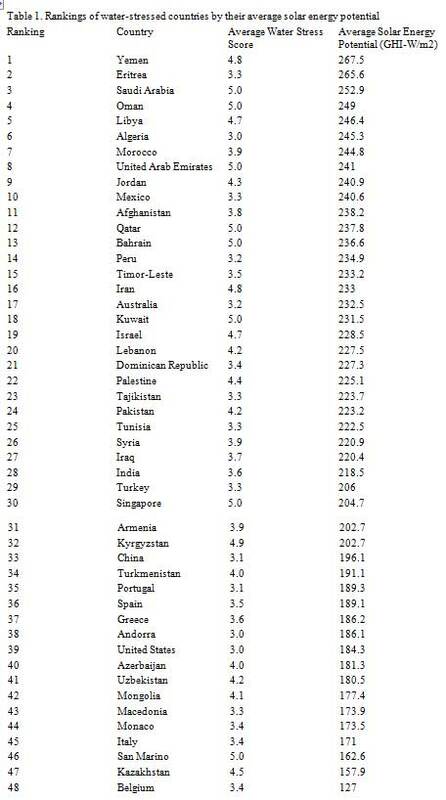 The top 20 water-stressed countries with the most average solar energy potential are in the Middle East and North African region; the rest are from Asia and Pacific, Latin America and Sub-Saharan Africa. 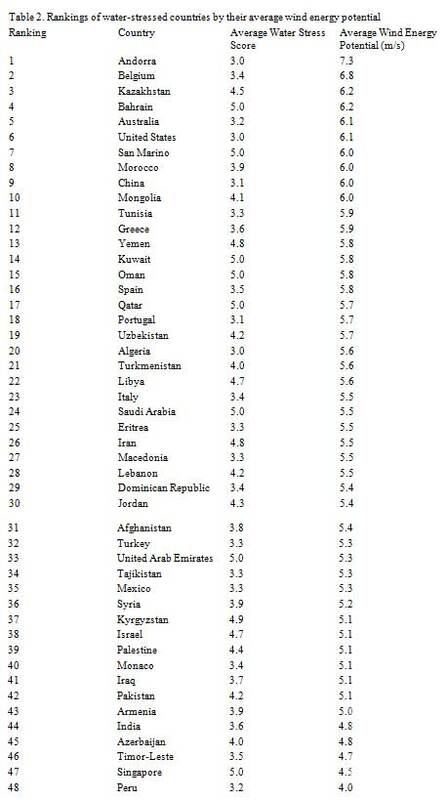 The list includes countries at all economic stages: three are developed (Australia, Israel and Saudi Arabia), four are some of the least developed (Afghanistan, Eritrea, Timor-Leste and Yemen), and the rest are from emerging or developing markets. Yemen has the highest average solar energy potential in terms of global horizontal irradiance (GHI), a proxy of the strength and concentration of solar energy hitting a PV panel. It’s also one of the world’s most water-stressed and least developed countries. The World Bank just invested $50 million in solar PV projects to restore electricity to more than one million Yemenis. However, with the ongoing civil war in the country, renewables development could still be challenging. Eritrea and Saudi Arabia have the second- and third-highest average solar energy potential, but very different economic power. It is more challenging for countries with constrained financial resources to adopt renewable technologies at a large scale. However, as the cost for solar and wind energy continues to decline, these options are becoming more attractive. Even oil-rich countries like Saudi Arabia are investing heavily in solar energy for domestic consumption, with a target of 9.5 gigawatts (GW) of solar and wind by 2023.